You, too, can understand geometry---- just ask Dr. Math ? ! Are things starting to get tougher in geometry class? Don't panic. Dr. Math--the popular online math resource--is here to help you figure out even the trickiest of your geometry problems. Students just like you have been turning to Dr. 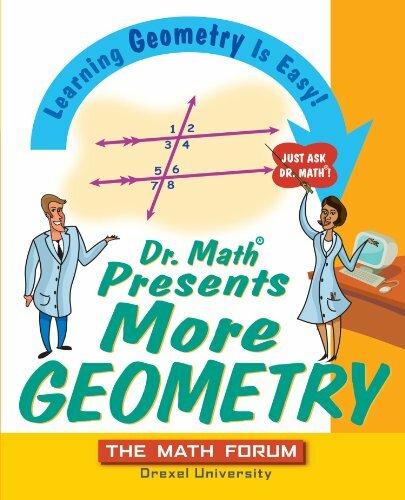 Math for years asking questions about math problems, and the math doctors at The Math Forum have helped them find the answers with lots of clear explanations and helpful hints. Now, with Dr. 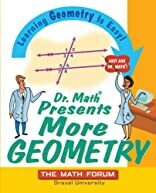 Math Presents More Geometry, you'll learn just what it takes to succeed in this subject. You'll find the answers to dozens of real questions from students in a typical geometry class. You'll also find plenty of hints and shortcuts for using coordinate geometry, finding angle relationships, and working with circles. Pretty soon, everything from the Pythagorean theorem to logic and proofs will make more sense. Plus, you'll get plenty of tips for working with all kinds of real-life problems. You won't find a better explanation of high school geometry anywhere!